One of the clerks of a well-known City merchant recently received an invitation to a masked ball at his employer’s, and was the envy of his comrades. Resolved to do all he could to make the occasion a success, he spent a good deal of time in devising and making his masquerade costume, which, after long deliberation, he resolved should be that of a monkey. Then he spent a week learning a number of tricks —grinning, clambering on the chimney-piece, springing on to the table, and balancing himself on the back of a chair. The evening came. He rang the bell, gave his overcoat into the servant’s arms, and, with a grin and chatter, turned a somersault under the chandelier. The gentlemen stood stupefied, the ladies screamed. His mask prevented him from seeing much, but the noise encouraged him to bound over a sofa and throw down a cabinet of old china. At this moment a hand seized him, tore off his mask, and the voice of his employer asked him what he meant by his idiotic conduct. Before he could explain he was hustled out of the house, learning by one glimpse that the rest of the company were in evening dress. The next day he was sent for, and entered the office with trembling knees. “I had the pleasure of a visit from you last evening,” said the gentleman. “Well, I’ll be blessed!” said the clerk, going out. His employer had made an early investigation into the matter, and found that the other clerks had “put up a job” on the young man by sending him a bogus invitation. The employer made things even by promoting him over their heads. Mrs Daffodil’s Aide-memoire: In the newspapers and women’s magazines, invitations to masked balls issued to young clerks by their employers almost always end happily, as we have seen previously in the story of The Four Red Devils. Mrs Daffodil does not think that this is a common occurrence in Real Life. She is puzzled by the extraordinary forbearance of the employer in not summoning the police or a lunacy commission, but perhaps the gentleman knew that the cabinet of old china was insured for far more than he had paid for his aesthetic-minded wife’s tiresome collection. This entry was posted in Edwardian, etiquette, Fancy Dress, Frolics, Gentlemen, Impostures and Swindles, Lethal Clothing, News and Announcements and tagged fancy-dress costume, masked ball, masquerade, masquerade costume, monkey fancy dress on October 7, 2018 by chriswoodyard. Unique and Weird Effects in Fancy Dress Costumes in London. London, January 23. Pageantry has seized the popular imagination, and in consequence there are to be an unprecedented number of fancy-dress balls and head-dress dinner and tea parties. Already the head-dress parties are in full swing, and quaint head-gear descriptive of various advertisements and the titles of notable books are adding to the gayety of country house parties. The “Merry Widow” hat and other footlight favorites are also in demand. The fancy-dress ball this season is taking precedence over all other forms of private entertaining, and it is already rumored that a royal fancy-dress ball is to be a fixture of the future. Every day brings increasing orders to costumers for fancy dresses of original design; for those of Shakespearean and Wagner’s heroes and heroines, for historic modes, for popular stage frocks, for the numberless old-time favorites representing the seasons, and for “Salome” dresses. 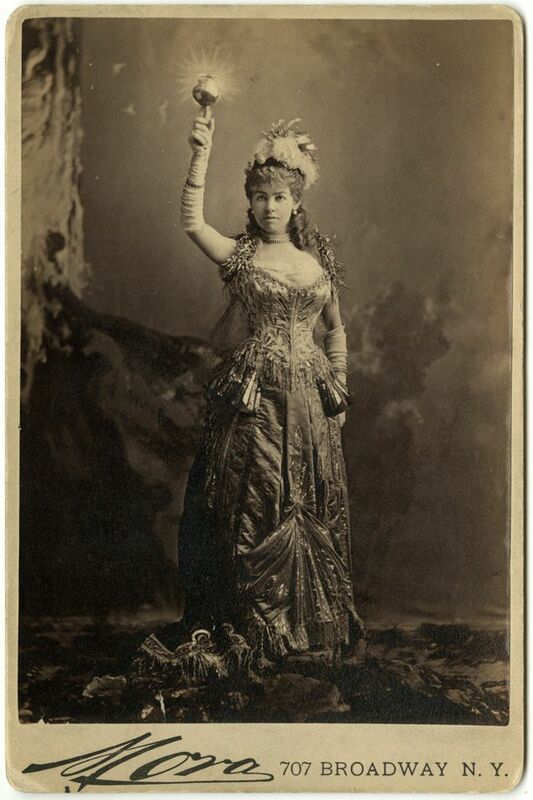 Strange as it may seem, there has been a great demand for “Salome” robes, modeled after Maude Allan’s own, for wear at private balls and parties. These robes are made of sterner stuff than that used by the famous dancer and the garish bosses and jewels, reflecting a myriad lights, are strikingly effective among the black swirling draperies. The modern costumer must be up to date, and each passing event, therefore, has some suggestion for him: hence the robe “Penny Post to U.S.A.” Again, pink satin is used, and the panels of the Princess robe are painted with pictures of the different post offices of England and America. The head-dress is composed of photographs of the Postmasters-General of England and America. In the hand will be carried a tiny barrow full of parcels and on one shoulder will be a perfect model of the Lusitania, gleaming with electric lights, and on the other piles of letters. Of exquisite beauty is a design called “On the moors.” It is in mauve satin, with a jaunty little tight-fitting coat, and the skirt is covered with purple and white heather. A squirrel sits perkily on one shoulder and a pheasant graces the other. The head-dress is also of heather, but it is lit up with a myriad lights. A new dress for men is the “Flip-flap,” which is most ingeniously devised. The knickers and coat are made of white satin and light arms are attached which can be revolved at will. The end of the arms are filled with tiny figures representing people, and are lit with electricity. 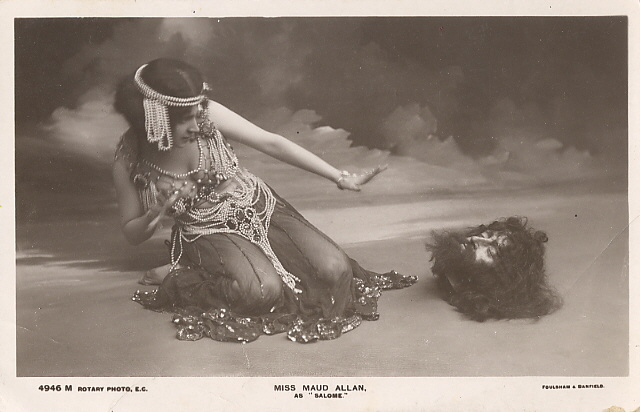 Mrs Daffodil’s Aide-memoire: Maud Allen was a dancer, notorious for her sensational “Dance of the Seven Veils,” in her production of “Vision of Salomé.” This photo-postcard will suggest why. In 1918 she was accused of obscenity, espionage, and various other crimes as popularised by Mr Oscar Wilde. The up-to-date Penny Post fancy dress celebrates the new Transatlantic Penny Post–a penny an ounce for letters sent to or from England. The Lusitania was mentioned as carrying the first mailbags in October of 1908. One cannot imagine the Postmasters-General of England and America being a picturesque feature of those headdresses. The Lusitania was of course, torpedoed by a German U-Boat in 1915 with a loss of 1,198 souls. This was one factor that brought the Americans into the War in 1917. The “Flip-flap” was an early roller-coaster amusement park ride. Mrs Daffodil hopes that the squirrels and pheasants used to accessorise “On the moor” were specimens of the taxidermist’s art. This entry was posted in Animals, Aristocracy, Edwardian, Fads, Fancy Dress, Fashion, Frolics, News and Announcements and tagged fancy dress, fancy dress balls, fancy-dress costume, Lusitania, Maud Allen, Penny Post, pheasant, Salome, squirrel on October 25, 2014 by chriswoodyard. Some further inspiration for your Hallowe’en fancy dress. This is “Baby Grande,” said to be a child star of the London stage, but more likely a rather shop-soiled “child impersonator,” of which the ranks of the Halls were rife. She took a prize at a fancy dress contest for her costume as “The Royal Fan.” It was a decided novelty, but perhaps not the most effective garb if one wishes to dance. 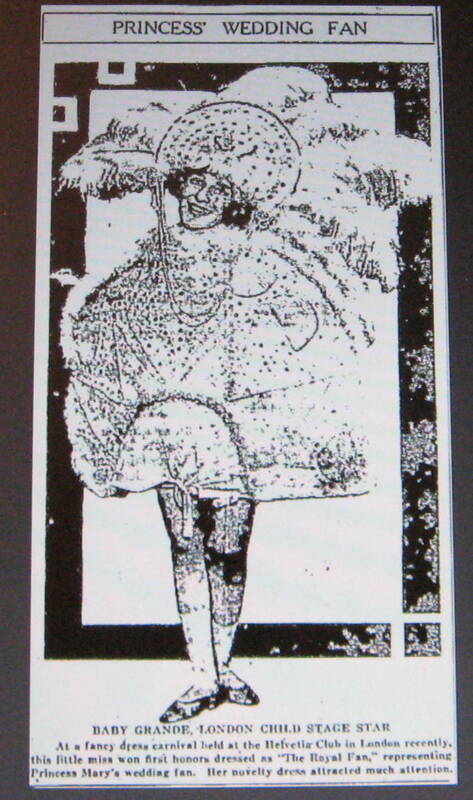 The photo above shows what appears to be the fan in question, although it has not been found in the lists of the Princess Royal’s wedding gifts. It bears a strong resemblance to Her current Majesty’s coronation fan. The guards appear to be tortoise-shell set with a monogram in diamonds. The whimsy, one fears, stopped with the young person’s feathered fan costume. Mary, the Princess Royal, lived a very sheltered life, trammeled by the restrictions of her mother, Queen Mary. According to what one hears, her brother, the Prince of Wales, was furious that his sister was being forced into an “arranged marriage” with a dour man 14 years her senior. While the papers made it out to be a love match, one account suggested that Lascelles proposed to the Princess on a bet from members of his club. The marriage was not a happy one. The Prince of Wales promised his sister he would see that she was released from her marital shackles when he came to the throne. Alas, when he became entangled with that American woman, he could no longer help her. The Princess was not freed until 1947, when her husband died. Mrs Daffodil wishes a quicker release for any of her readers burdened with an uncongenial spouse, but cautions that modern tests for arsenic and the alkaloid poisons are highly accurate and stand up well in court. Mrs Daffodil also suggests that the unhappily yoked consult a solicitor for results that do not involve assisting the Police with their inquiries. 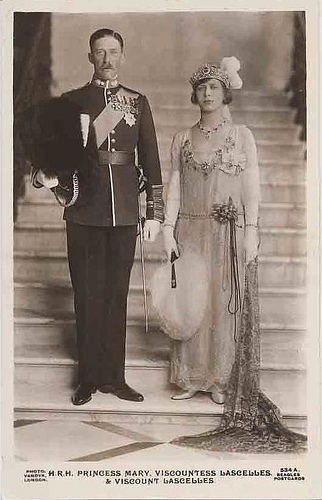 This entry was posted in Fancy Dress, fans, History 1910-1930, Holidays, Husbands and Wives, News and Announcements, Royalty and tagged child-impersonator, fancy-dress costume, fans, Mary Princess Royal, Queen Mary, wedding fan on October 20, 2013 by chriswoodyard. The literary Irwins have done a big share in making San Francisco known in New York. What with Will Irwin’s work on the Sun, later as managing editor of McClure’s, and now as an events specialist for Collier’s, and Wallace Irwin’s pointed verses that put a quiver even in the side of the staid east, good things that come out of our Nazareth are taken more and more as a matter of course. But this is a story of clever doings not of a male Irwin, but of Mrs. Will Irwin, who, apparently, is ingenious enough to find time for things besides the careful uprearing of the heir to the Irwin fortunes. Mrs. Bill has come to California for a brief visit, and there has come with her the story of her recent appearance at an authors’ and artists’ dress ball as an earthquake. Fancy it! And the point to the story is that she looked and was the part and needed no label. Mrs Daffodil’s Aide-memoire: Mr. William “Will” Irwin was a journalist, catapulted to fame by his coverage of two horrific disasters—the sinking of the General Slocum and the San Francisco Earthquake. He had formerly worked for the San Francisco Chronicle, but was in New York, writing for the Sun when the earthquake hit on April 18, 1906. His editors assigned him to flesh out the scanty telegraphic reports arriving from the devastated city from his first-hand knowledge. The earthquake-clad Mrs. Irwin was his first wife, who, the papers say, divorced him in San Francisco in 1907. One wonders how quickly the divorce followed after this extraordinarily tasteless costume worn in the wake of one of the worst natural disasters in US history. Irwin’s second wife, Inez Haynes Irwin, was a feminist, suffragette, war correspondent, and prolific author, whom one cannot imagine donning fancy-dress under any circumstances. 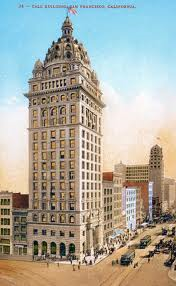 The San Francisco Call building. 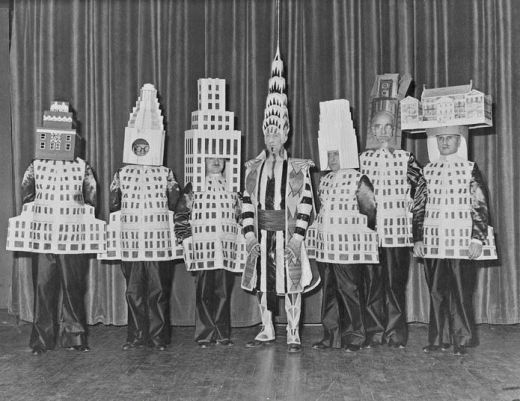 This entry was posted in Edwardian, Fancy Dress, Frolics, Husbands and Wives, News and Announcements and tagged fancy-dress costume, Inez Haynes Irwin, masquerade costume, San Francisco Earthquake, strange Halloween costumes, Will Irwin on October 16, 2013 by chriswoodyard. Struck by a happy inspiration, she decides to attend the fancy-dress party as a knitting bag. From the Christian Science Monitor. Here is an idea of a decidedly novel fancy dress costume. One young woman has tried it with great success. She was going to a costume party and she did so want to appear in something new and truly original. 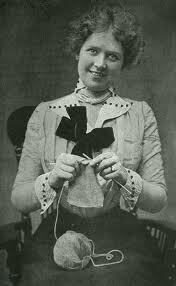 She knitted away industriously, as she meditated upon what she should wear. It was hard to think of something that none of her friends or acquaintances had ever tried, and something moreover, which would not demand too much time and work in preparation. 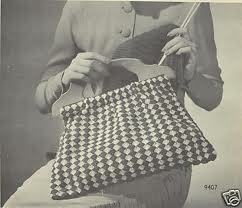 She glanced at the pretty knitting bag beside her and then the idea came. Why not go as a knitting bag! Mrs Daffodil’s Aide-memoire: Mrs Daffodil so wishes that she had a photograph of this novel and eccentric fancy-dress costume. The knitting needles would have proved useful as a weapon to ward off any unwanted suitors driven to madness by this provocative garment. This was obviously a frame-less, draw-string knitting bag. If any of Mrs Daffodil’s readers are knitters, perhaps they could make a version incorporating the more recognisable wooden rings or handles hanging down back and front. Bamboo rings and wooden handles are readily available at the needlework store. 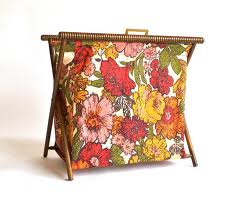 Add material from an old curtain, and hey presto! you are the perl of the ball! Crafting a costume based on a standing knitting bag will entail using one of those folding wooden laundry driers and is not recommended if one wishes to dance. This entry was posted in Edwardian, Fancy Dress, Frolics, News and Announcements and tagged edwardian costume, fancy-dress costume, halloween costume, home-made costumes, knitting, knitting bag on October 6, 2013 by chriswoodyard.